Yushchenko's party to form coalition with Yanukovych? President Viktor Yushchenko still wants to form a coalition government with his Orange Revolution partner, his allies said Thursday. A statement a day earlier from the president has raised questions about whether his party would stick to that course. In his remarks, Yushchenko called for cooperation with his main political rival, Prime Minister Viktor Yanukovych. Yuiry Pavlkeno, a senior member of the pro-Yushchenko party, said the president's statement signaled only that he wanted better dialogue with his political opponents and did not call for forming a governing team with Yanukovych. After Sunday's parliamentary election, Yushchenko was expected to tap Yulia Tymoshenko, an important figure in the Orange Revolution that brought him to power three years ago, for the premiership. Near-final results showed Tymoshenko's bloc and the pro-presidential party had enough seats to forge a ruling coalition. The two parties had agreed earlier on forming a Cabinet and unseating Yanukovych, whose party won the most votes but lacks a strong enough partner to assemble a governing administration. In his remarks Wednesday, Yushchenko reached out to all three major political forces, urging them to exercise "political wisdom" and work together for the sake of national unity and stability. "I have one goal: Ukraine must emerge united following the elections; there must not be two Ukraines," Yushchenko said in a televised speech. Speaking later in Berlin, Yushchenko suggested that if his party and Tymoshenko's bloc secure a majority in parliament, they should consider giving Yanukovych's forces Cabinet posts, the Interfax news agency reported. Yushchenko appeared to be concerned about the prospect of instability if the country - already polarized by regional, historical and linguistic divisions - is governed by one political side. But the statement opened the door to the kind of paralyzing standoff that led him to call the early elections. But Pavlenko said Thursday that the pro-Yushchenko party would make good on its agreement to form a coalition with Tymoshenko. "Our decision ... is unchanged," he said, according to the party's Web site. 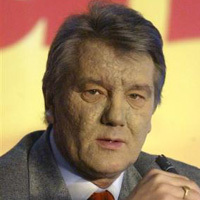 Analysts said Yushchenko may be reluctant to invest too much power in Tymoshenko, a potential rival for the presidency in 2009. Yushchenko and Tymoshenko were the linchpins of the 2004 upheaval, when hundreds of thousands of people poured into the streets of Kiev claiming fraud in the presidential election. Yanukovych was initially declared the winner, but Yushchenko won a new vote after a court threw out the initial results. He then named Tymoshenko as his prime minister. He fired her after seven months; their bickering helped bring Yanukovych back to power as prime minister last year. Yanukovych, who was backed by Moscow in 2004, has taken a more neutral stance since then, pledging to integrate with the rest of Europe, but is still seen as more Russia-friendly.